Preheat oven to 450° F. Spread pesto on Boboli® pizza crust. Place sliced tomatoes over pesto so that it covers the entire pizza. 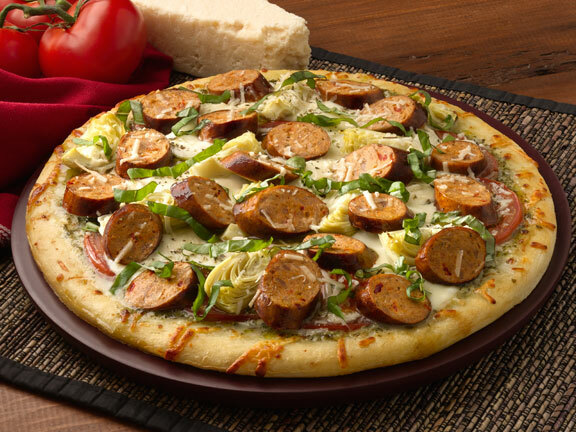 Slice al fresco® Roasted Pepper & Asiago Chicken Sausage in 1/4" slices and place over pesto. Position the slices of fresh Mozzarella over the tomatoes and then sprinkle the chopped artichokes. Next, sprinkle the 1/2 cup of shredded Asiago cheese over the artichokes. Bake in oven for 8 - 10 minutes or until golden brown. Remove pizza from the oven and sprinkle basil and Italian seasoning on top. Let cool and enjoy!